The President Is Dead. Long Live the President. It’s Saturday – time for another trip to the presidential archives. To understand the significance of today’s archival document, you need first to look at the document’s date: November 23, 1963. It is, of course, the day after President Kennedy was assassinated in Dallas by Lee Harvey Oswald. The memorandum from Kermit Gordon, the Bureau of the Budget director, to the new President is a reminder that even as the nation struggled to cope with this enormous tragedy, the wheels of government continued to turn despite the suddenness of the transition in power. (The BoB is the forerunner of today’s Office of Management and Budget). In the memo, Gordon tries to accomplish two objectives. First, he assures Johnson of his, and the BoB’s fealty to the new administration. In the very first section, Gordon describes the BoB’s central mission as follows, “The BoB is a staff agency to the President which, by tradition and in fact, has no constituency other than the Presidency and no obligations which complicate its allegiance to the President.” I think Gordon’s interchanging the words President and Presidency is significant – it shows his understanding that the BoB is in service to the Presidency as an institution as much as it is to the President as an individual politician. (Elsewhere Andy Rudalevige and I have written about the BoB’s commitment to protecting the interests of the presidency as an institution. Gordon then moves to the topic of immediate interest: putting together the 1965 budget. He writes, “Despite the fact that the time is late, I know that you will want to make this budget your budget” (underscore in the original memo) before laying out the schedule of key dates in the budget process. 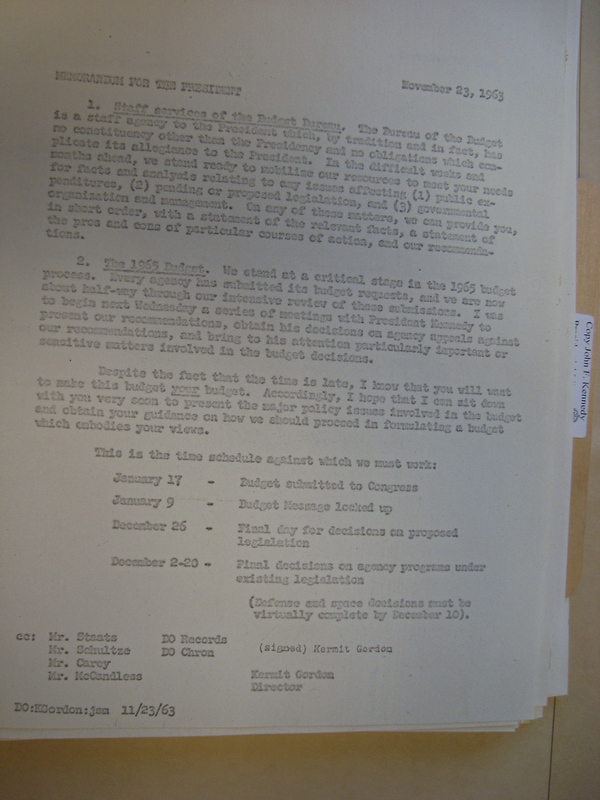 Here’s the document, which came from Gordon’s file contained at the JFK Library. The document is an extraordinary testament to the ability of officials at the highest levels of government to continue to carry out their basic responsibilities, such as putting together the annual budget. But at the same time, these officials recognized that there was a new President, who had his own priorities. Shortly after this memo was drafted, Gordon sent in this memorandum offering his resignation. 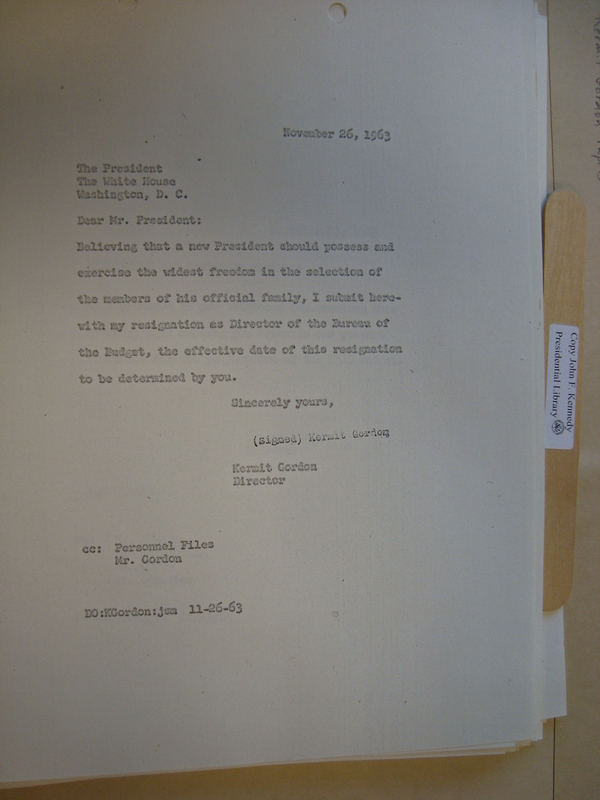 The letter begins, “Believing that a new President should have and exercise the widest freedom in the selection of the members of his official family….” and ends with Gordon’s offer to resign. Johnson did not accept the resignation and Gordon stayed on through 1965, helping LBJ craft his Great Society budgets. After his resignation Gordon became the President of the Brookings Institution where he used the think tank as a platform for both defending LBJ’s Great Society but also as a means for criticizing the Vietnam War. Meanwhile, Johnson would effectively capitalize on the need for continuity by citing JFK’s legacy as a reason to push through his Great Society program – but also to continue, and escalate, the U.S. war effort in Vietnam.